From our first test unit test drive, we knew the Chevy Volt would be a seriously technologically advanced electric car when it debuts next year. Now GM's saying they've built Blackberry and iPhone apps to control some vehicle functions. At Chevy's press conference at last week's LA Auto Show, outgoing Chevy manager Brent Dewar quickly flashed a slide across the screen revealing GM's intention to develop mobile phone applications for controlling and interacting with the Volt. GM sources have told the charged-up folks at GM-Volt that there will be applications at least for the iPod and the Blackberry and we should expect them to be unveiled ahead of the Volt along with their potential functions. 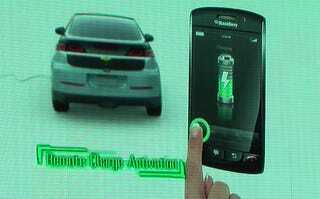 For starters, the app will allow for control of when to charge the car. GM-Volt's Lyle Dennis also expects to see applications receiving signals from the car as well, indicating when charging is completed and if the driver forgot to plug it in at some time interval after arriving home. Read more of Lyle's account of what to expect over at GM-Volt. What would you like to see in a Volt app?